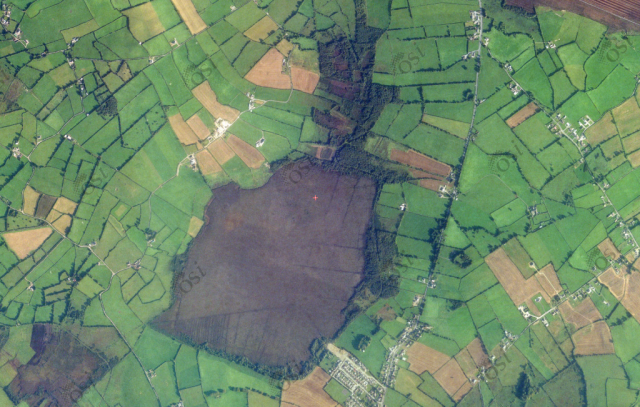 Ferbane Bog SAC is estimated to be over 10,000 years old, occurring in a basin, predominantly underlain by limestone, with clay-rich tills above the bedrock. It has a discreet, raised dome and is a unique site in terms of this LIFE project, due to its proximity to the town of Ferbane. 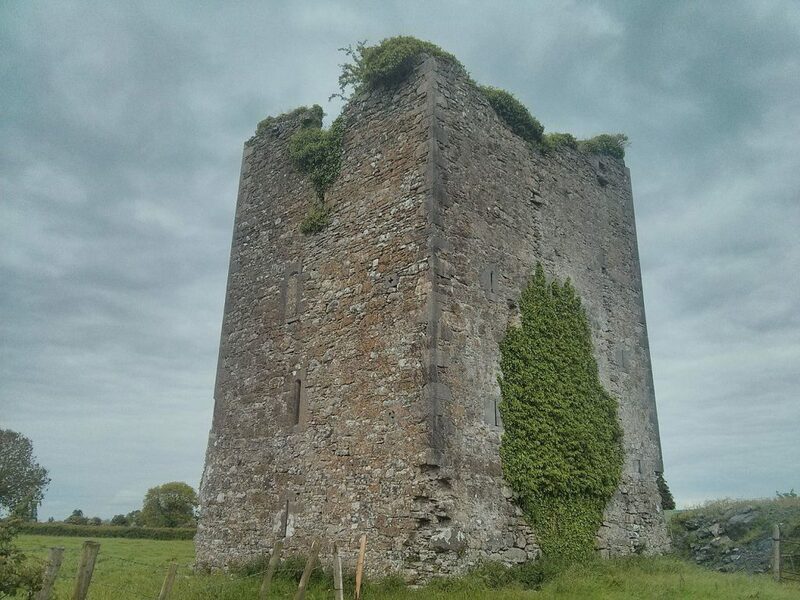 It is also just a short distance from another of our project sites: Moyclare SAC. The raised bog here began to develop in the basin lake in which anaerobic conditions occurred. Complete decomposition of plant material was prevented. In time this un-decomposed plant material formed a thick layer of peat that rose towards the surface of the lake. Eventually the surface peat was invaded by sedges to form a fen. The fen peat layer thickened so that the roots of plants growing on the surface were no longer in contact with the calcium-rich groundwater. The only source of minerals for plants was now rainwater, which is very poor in minerals. Raised bog species, such as Sphagnum mosses begin to invade and eventually the fen becomes a raised bog. The surface of a raised bog consists of a soft living carpet of vegetation, which floats on a material which is nearly all water. 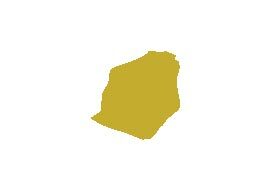 By weight, a raised bog may be up to 98% water and only 2% solid matter. This volume of water is held within dead Sphagnum moss fragments. Raised bogs consist of two hydrological layers: the upper, very thin layer, known as the acrotelm;, is usually less than 50cm deep, and consists of living stems of Sphagnum mosses, recently dead plant material and water. The acrotelm has high permeability to water near to the surface, but becomes more impermeable with depth as the peat becomes more consolidated and decomposed (humified). Water movement and fluctuations mean that conditions in the acrotelm remain largely aerobic and it is here that microbial activity is strongest. The acrotelm is critical to the normal development and functioning of a raised bog. Below this is a very much thicker bulk of peat, known as the catotelm, where individual plant stems have collapsed under the weight of mosses above them to produce an amorphous, dark mass of Sphagnum; fragments. Catotelm peat is typically well consolidated and often strongly humified. It is permanently saturated with water. Water movement through this amorphous peat is very slow, typically less than a meter a day. This is where most of the rain water is stored. Deep drainage associated with turf cutting means Ferbane has suffered in the past, with the south and east traversed by drains. In the past, peat cutting to the north and east of the site was significant. 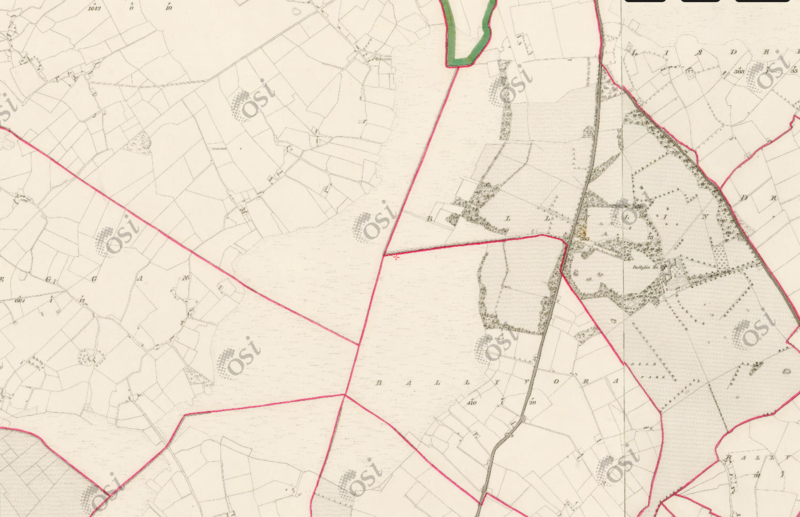 There is a series of lines drawn on the 1910, 6” map, which correspond with old turbary rights. 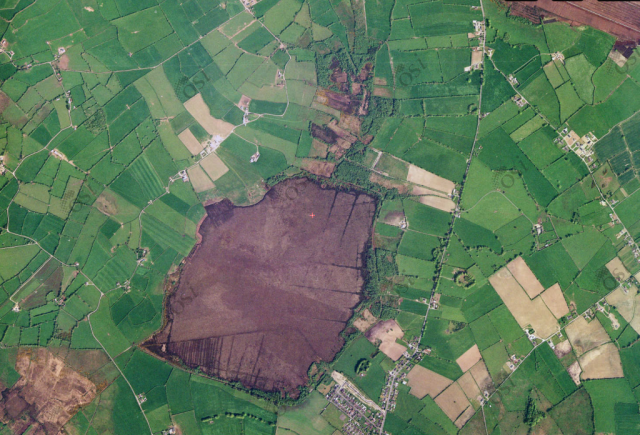 More recent peat extraction is evidenced by abandoned sausage machine cut peat, at the north and south of the site (Kelly et al., 1995). The bog was selected for development as a peat source by Bord na Mona in 1983. This has not occurred and the site was subsequently transferred to National Parks and Wildlife Service ownership in 1996. The majority of the bog is in public ownership. The 1910, 6” map shows planted forestry to the east of the site. This was probably predominantly Scots Pine. This has most likely been felled and regenerated over the years, with the invasion ofother species such as Birch. Bogs in this part of the country – and in particular the once common raised bogs – are synonymous with the fuel industry. Ferbane owes an awful lot to the now demolished power station, which employed thousands in the five decades it was operational. 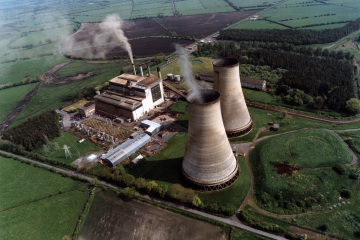 It was the first ever milled peat fired power station to be built and commissioned in Ireland, the first in the world outside the former U.S.S.R.
Construction started in 1953 and it was commissioned by the Electrical Supply Board (E.S.B.) in 1957 with the first development of 60,000 kilowatts. The second stage of development of a further 30,000 kilowatts commenced in June 1961, and was commissioned in January 1964. This brought the total capacity of the Station to 90,000 kilowatts, capable of producing about 400 million units of electricity a year. At its peak in the 1970s and 1980s, the station burned 2,000 tonnes of peat daily, producing about 2 million units of electricity daily when its four units were at full load. 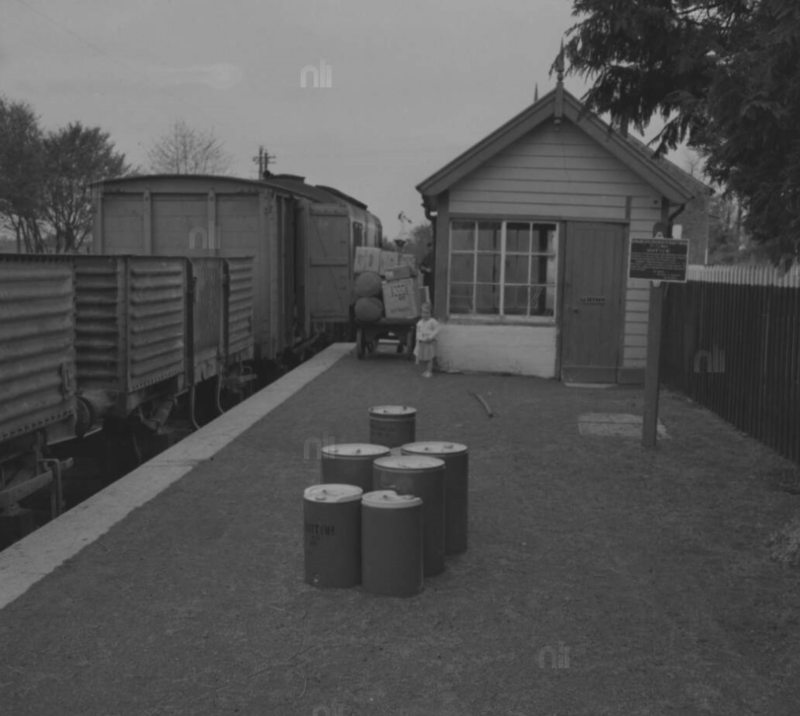 The milled peat was brought in by train on narrow gauge lines, mainly from the Lough Boora complexes. Each unit consisted of a boiler, a turbine, a generator and a transformer. Boilers 1, 2 and 3 (first development) each produced 100 tons steam per hour, at a pressure of 30 kg/cm2 and temperature 440°C to drive Brown Boveri 20 MW turbines and directly coupled generators at 3,000 revs per minute. The 4th unit (2nd development) had a 130 ton/hr boiler giving steam at a pressure of 63 kg/cm2 and at a temperature of 510°C which drove a 30 MW Parsons Turbine and directly coupled Generator at 3,000 revs per minute. The electricity was generated at 10,000 volts and transformed to 110,000 volts for transmission into the national grid. However, the station was getting old and by the mid 1990’s the obsolete station was contributing little to the National Grid. Closure was recommended for 1998. However, its closure was not without its controversy, as the Irish Independent reported in 1998 and the Irish Times reported in 2001. It had not provided power for almost three years before it was finally closed. Demolition took place in 2003, and the ESB have recorded its demolition HERE. 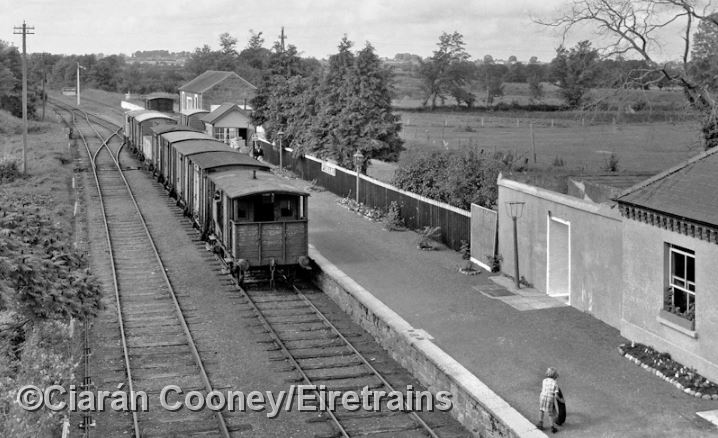 Once-upon-a-time, Ferbane was a key stop on the former 17 mile branch from Clara to Banagher, constructed by the Clara and Banagher Railway and opened in 1884 (after a protracted construction as a large section went through bog). 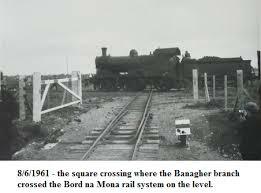 Clara-Banagher started out as an independent line but ran out of money a few times and was eventually taken over by the Great Southern and Western Railway, linking Ferbane to all the major lines and destinations. The line lost its passenger service becoming freight only in 1947. The line remained in use for goods and occasional special services until it was closed in a tranche of branch closures all over the country in 1963. 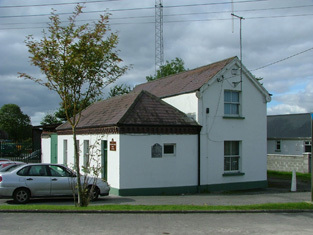 The former station in Ferbane remains visible to this day, with the station building, a Victorian structure built in 1884, surviving, along with the goods shed. The station is now reused, housing offices for the local Council. Architecturally, the design is both simple and functional, adorned by few enrichments like bargeboards to the gables, cast-iron rainwater goods and stepped brick cornice to eaves. 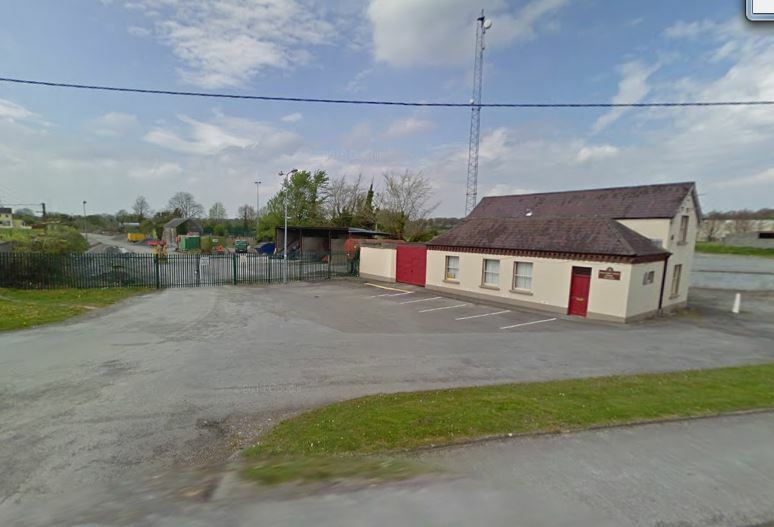 Like a lot of midlands stations (and others on the Banagher branch), it was a combination of a single and two-storey building. The former Ferbane Station today, with the goods shed (now a Council storage shed) to the rear. No train line remains. However, the platform and road overbridge (which carried the N62) is long since demolished, and most of the line itself is long gone. 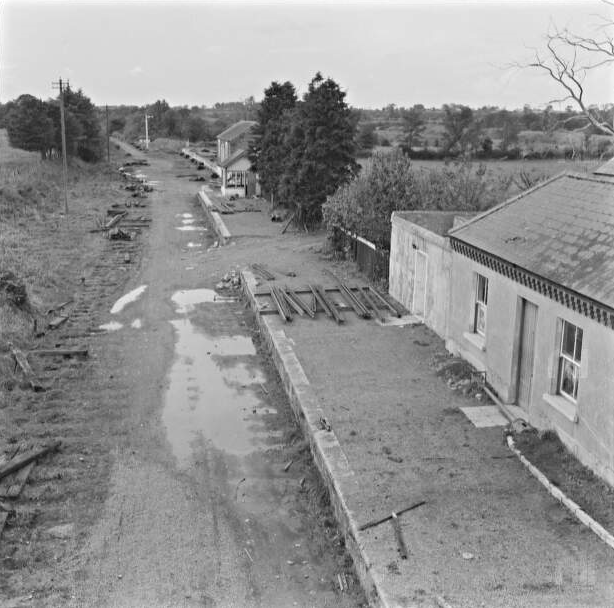 The branch left the Portarlington-Athlone line at Clara and Banagher Junction, just outside the town. There was also a station at Belmont.